The 2017/18 statistics from the RSPCA have been published and there is some seemingly very, very good news contained within. Just 5,577 dogs* were killed nationally, which for the major animal welfare organisation in the country, in a nation of 24 million people is extremely enviable. So why isn't this a massive story out of the RSPCA? Well, probably because of this. While in the late nineties and the early 2000s dog impounds at the RSPCA ranged from consistently over 60,000, to nearly 80,000. This past year, dog impounds have dropped for the first time, to under 40,000. Or nearly halved. 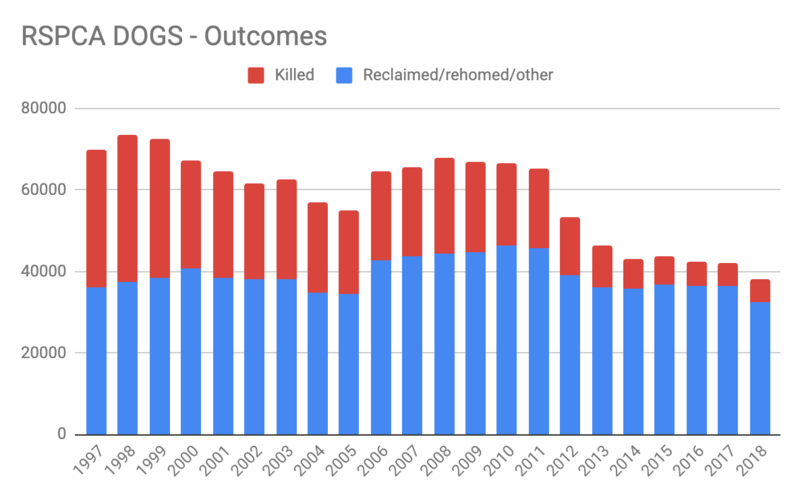 This drop in intakes seems to nearly entirely account for the improvement in kill rates, with reclaims, adoptions and other outcomes for pets remaining pretty consistent over time. Taking in so many less dogs (while at the same time running down the rescue groups who have stepped up - and in - to absorb the workload left by the RSPCA when they began to pull out of rural and regional areas) might very well be a position the RSPCA is loathe to draw attention to. And of course, the RSPCA is always quick to point out that they don't just run shelters; they're also the enforcement agency for animal welfare legislation. Enforcing animal welfare law, state by state. The ACT has a human population of about 400,000 people. 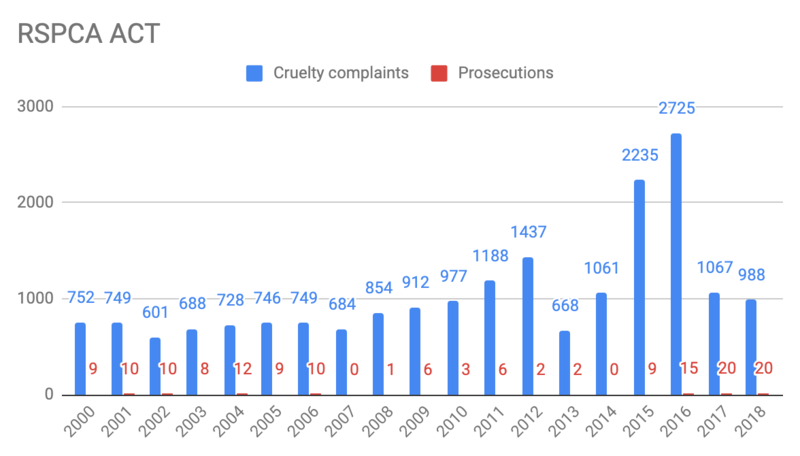 The RSPCA ACT received 988 cruelty complaints and brought 20 prosecutions last year. NSW has a human population of about 7.5 million people. The RSPCA NSW received 15,451 cruelty complaints and brought 72 prosecutions last year. QLD has a human population of about 4.7 million people. 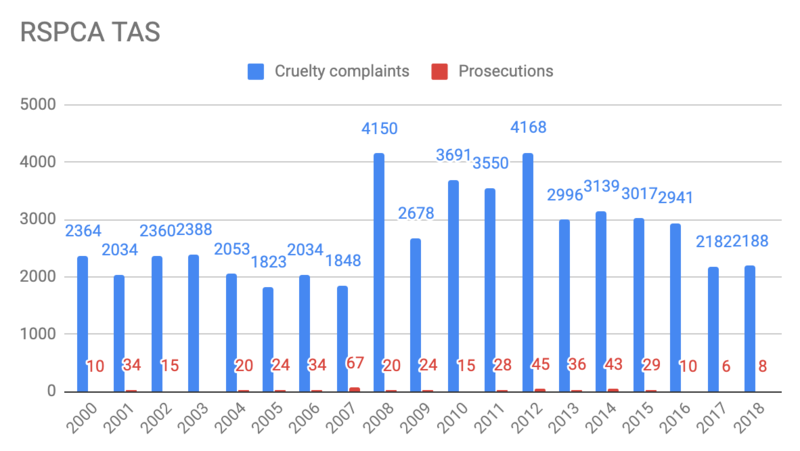 The RSPCA QLD received 17,929 cruelty complaints and brought 75 prosecutions last year. South Australia has a human population of about 1.7 million people. The RSPCA SA received 3,837 cruelty complaints, and brought 70 prosecutions last year. Tasmania has a human population of about 520,000 people. The RSPCA Tasmania received 2,188 cruelty complaints, and brought 8 prosecutions last year. Victoria has a human population of about 6.4 million people. 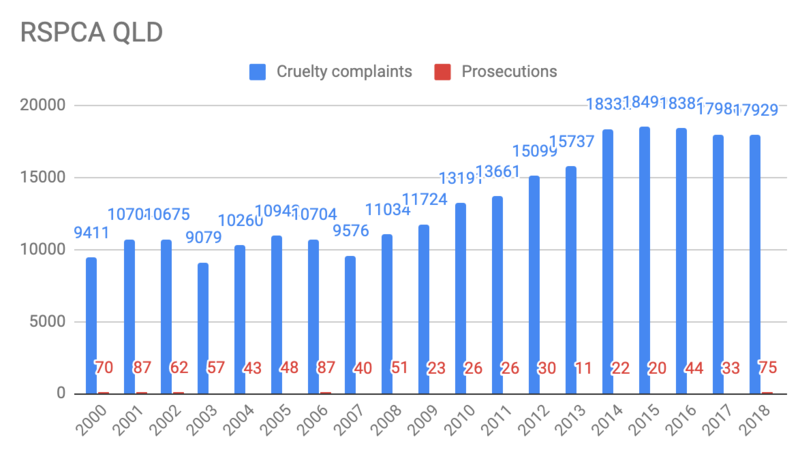 The RSPCA VIC received 10,642 cruelty complaints and brought 113 prosecutions last year. WA has a human population of about 2.6 million people. The RSPCA WA received 6,057 cruelty complaints and 12 prosecutions. 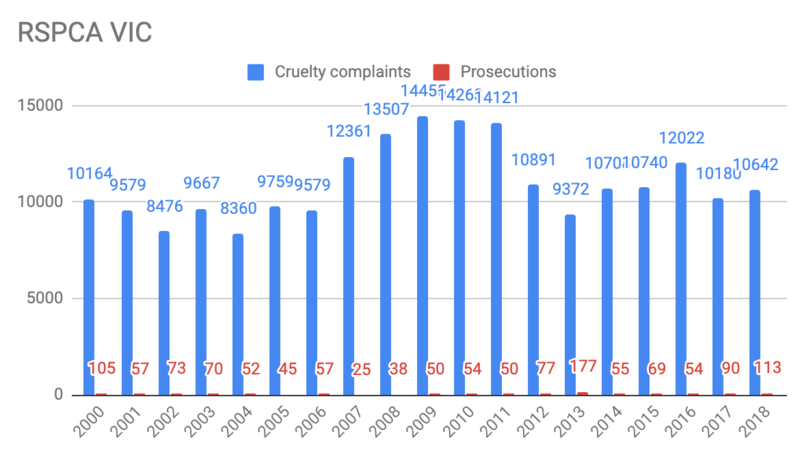 And making the number of people investigated under an animal cruelty complaint 0.23% - or not even half of one percent of the human population of Australia, and 0.0015% of the human population being prosecuted during the year. (Compared to say, more than 3,500 speeding fines being issued in Victoria, every day). 370 prosecutions in a country of 24 million should be a reason to celebrate. Just 5,577 euthanised dogs in a country with an 4.8 million pet dogs is a reason to celebrate. So why aren't the RSPCA publicly celebrating? Maybe it's because of this. One hundred and ninety MILLION dollars in a single year. 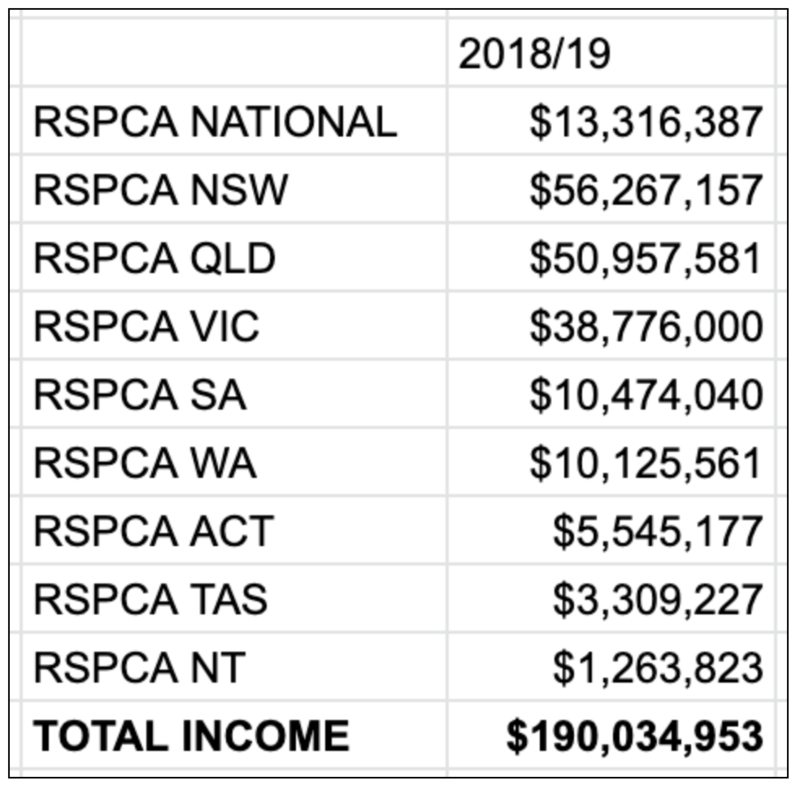 While dog intakes have dropped precipitously and we see less than 400 cases brought before the courts prosecuting animal protection laws, the RSPCA’s income has blown out from around $100 million dollars at the start of 2000 - to over $190 million today. Why isn't the RSPCA celebrating? Well, lower intakes and a few hundred prosecutions is completely dissonant with the massive operating budget gifted to their organsation each year. Is it time for Australia to investigate the RSPCA's role in the community and whether their impact is reflecting the investment we're making in the organsation? *Cat intakes are basically unchanged for at least two decades. The pound system is a complete failure for cats.